Now it’s 2007. The music landscape is different from 1975, but in many ways it’s also the same; this is to say, an artist really going out there and experimenting – as innocent as it may be in intention – can still shock and upset its core audience, no matter how open-minded they were thought to be. 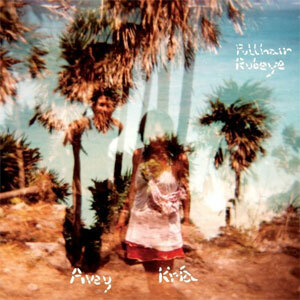 First, a quick bit of background is necessary: Avey Tare (aka Dave Portner, of freak-folkies Animal Collective) and his wife Kría Brekkan (aka Kristín Anna Valtýsdóttir, formerly of twee glitch makers Múm) made an album of indie folk tunes. Then, influenced by equal parts odd weather and David Lynch’s Inland Empire, the couple decided to release the album backwards. Every song, start to finish, played backwards, plucks turning to sweeps, vocals lost in a sea of a new, ephemeral language (from which the songs get their titles). Like Lynch’s Empire, Pullhair Rubeye has had a polarizing effect on those who experience it, mostly because people either can’t seem to figure out (or are unsatisfied with the answer provided) why Tare and Brekkan decided to go this route. The only option left to consider, however, is that there really, truly, isn’t a deeply reasoned answer as to why the album is back masked. In releasing it this way, however, Tare and Brekkan lay claim to the first truly and purely experimental recording in the history of either’s output. Pullhair is not simply pop or folk with experimental overtones and interludes; rather, it is a simple and complete experimental deconstruction of those more traditional song forms. By listening to these songs in such an unfamiliar format, the listener cannot take anything for granted – every breath, every strum, and every pluck swims by as a series of brief crescendos. Nothing is familiar, at least not until after a few listens, as Pullhair challenges listeners weaned on traditional song craft to learn about music again. Inevitably on a backwards album, the vocals play a different role. Tare and Brekkan’s hushed singing is not telling a story, but rather painting a sonic picture. While the idea of reducing vocals to a lyric-free instrument isn’t new – see Belinda Butcher on My Bloody Valentine’s Loveless – it works especially well to illustrate the contrast between Tare’s soft, aching chant and Brekkan’s bird-like, whimsical singing. Despite the absence of discernable lyrics, the vocals still manage to affect a series of themes and emotions upon the listener, from the springtime of Osip Helpus to the childish Sasong. Indeed, just as playing the song backwards manages to impress upon the listener a sense of greater importance and purpose, the back masked vocals further expand the potential lyrical themes. Like Sigur Ros’s singing in the made-up ‘Hopelandish’ language, the vocals here become lyrical chameleons, adopting different meanings according to the environment in which they are listened to. The same line here can be a joyous celebration, or a mournful reflection. In the end, it all comes back to Metal Machine Music. Even today, the album is able to alienate 99.9% of those who listen to it – yet it has been reissued more extensively than any other album in Reed’s solo catalogue. Over time, enough truly adventurous spirits have come to appreciate it as an album that flipped Reed’s rock n’ roll styling on its head, even if it was also a mickey. Hopefully, Pullhair, with its backwards recording a simultaneous statement of revolution and afterthought, will influence contemporaries and followers to take the chance and fully see beyond the confines of traditional structure. Oh, everything gets 5/5 these days, even records played backwards. Incidentally, have you tried playing it forwards? What did it sound like? I should say, I did not come about the decision of the number rating lightly. In fact, I almost didn’t give this one a number rating, since I really just wanted the review to speak for itself. I certainly realize that my assessment of the album does not seem to be the popular one – and I can definitely see how one could come about the opinion that this was simply a naive and stupid mistake. I still stand by my review, and the rating. Additionally, I don’t think there’s much inflation to my ratings – check my other posts for this. Regarding whether I have played the album “forwards”; yes, I have heard a couple of the tracks that way. However, it’s really not something I’m all that interested in. As I see it, there was an artistic intention in releasing the album backwards, and I really don’t feel a pull to “correct” that. I would say that, part of the fun of the album, is to not do that. I you would like to hear it that way, however, there are plenty of programs which can re-reverse the album for you, or you can always search for the tracks in their original form. Thank you for taking the time to read / comment, and thanks for enjoying the site! Hi David, thanks for the reply. Didn’t mean to imply you inflate your ratings (I’m sure there is a sound methodology behind the score. Excel spreadsheets and a team of number crunchers are no doubt involved). And I certainly didn’t call it either naive or stupid. The fact that it doesn’t agree with everyone else’s is irrelevant; indeed this is the first review of Pullhair I’ve read. About the forward thing – as you say, this was probably just an afterthought, so there must still be a set of songs which were originally written and designed to play forwards, and if they were in fact any good, I’d like to hear them. I’m not sure I’ll be interested in hearing the record backwards more than once or twice (do you intend to keep listening to it that way? ), but I will give it a go, and I’d love to be convinced that this is something other than a silly gimmick. As for influencing others, I await with interest for the first album released sideways.